Want to explore North Karnataka? Rest assured, there's no better place to set up camp than at Hubli. Not only is it foodie heaven (we're already dreaming about girmit, jolada rotti, and spicy saoji masalas), it's also very well connected in terms of travel, be it by air or rail (it's the headquarters of the South-Western Railway Zone!). What's more, the city is only hours away from most, if not all, beautiful travel spots in the north of the state. Known as the Mini-Tibet of India, Mundgod is a tiny, unassuming town just about an hour and a half from Hubli. Spend a day exploring the town and pay a visit to its seven gigantic monasteries, with their ornate prayer halls and intricately shaped mandalas. If you're lucky, you might even get to see the maroon-robed monks deep in prayer, chanting hymns. Have a scrumptious feast of traditional Tibetan food (thukpas and momos FTW! ), and shop for delicate china and pretty souvenirs from the many shops in town. Looking for some adventure? There's no better place to go than Dandeli, and it's only two hours away from Hubli. Check in to The Hornbill or the Magenta Resort where you can live the rustic life and pack your day with plenty of water sports. We especially recommend going white water river rafting in the fast-flowing Kali river or trying your hand at kayaking. There are other fun activities too, like zorbing, jungle safaris and even a natural jacuzzi where water streams out of mountains and rock beds (go get that ultimate spa experience!). Located just a couple of hours away from Hubli, Belgavi has some must-visit historical structures. The Belgaum Fort, for instance, was constructed in the 13th century and it's right at the city's centre. Within the fort, you'll also find a couple of beautiful Jain temples. We recommend visiting the Kamala Basti temple - featuring black, basaltic stones and housing the Neminath idol, it truly is a sight to behold. And if your josh is high at the end of your Belgavi trip, head to Koti Kere, where you can see the country's tallest flag flying high! Speaking of flags, you should also check out Khadi Gramodyog (just on the outskirts of Hubli). Whether you're a history buff or simply patriotic, you will enjoy your experience here. For many years now, whether it's in government schools, the Red Fort or in embassies around the world, the Indian tricolour has only been made by the Khadi Gramodyog in Hubli. Head here to learn everything about the history of the Indian flag and the strict laws surrounding its production. You can also shop for their hand-woven khadi products along the way. Tired of the fast-paced city life? 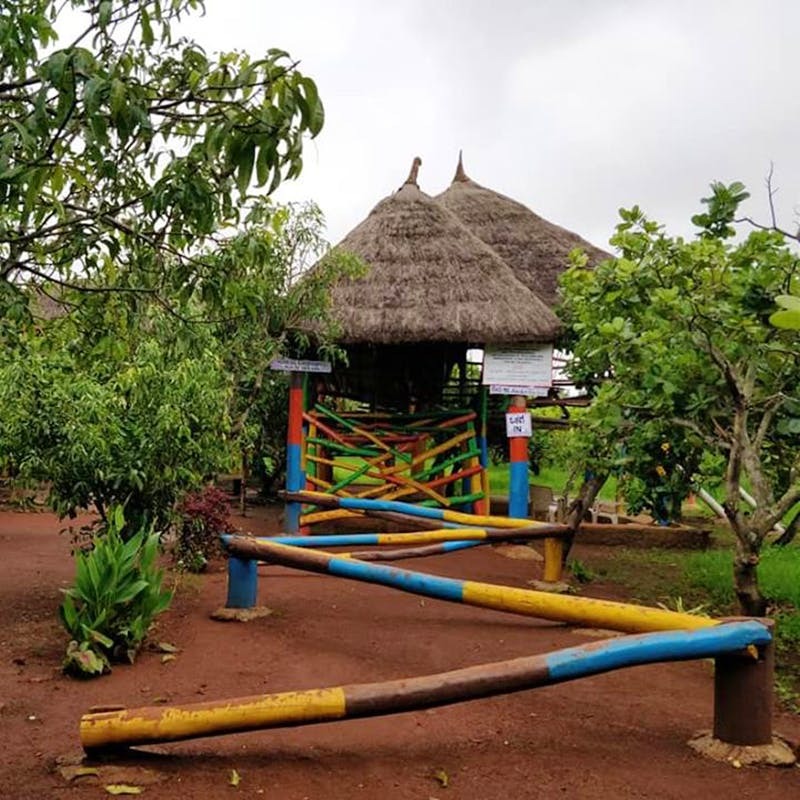 Spend a day at Agadi Thota, a lush 30-acre farm located to the south of Hubli, and experience the life of a North Karnataka farmer! Explore the vast acres of land on your own or go traditional and take a bullock-cart ride (they even have camel, tractor and tonga rides!) down narrow roads surrounded by coconut trees. Find yourself immersed in North Karnataka culture by learning how to churn buttermilk, grinding chillies and getting glass bangles fitted. Not to mention, they have a spectacular spread of North Kannada food that will leave you in a food coma. Planning a day's getaway? You can't miss the breathtaking Sathodi Falls near Yellapur, which is less than two hours from Hubli. Here, a bunch of streams gets together to form a waterfall. If you're planning on staying for a weekend, book a cottage at Shree Sai River Resort in Yellapur - nestled in coconut plantations and bamboo groves, you can enjoy crocodile watching or get a glimpse of the local hamlets and the tribal bonfire dance. Get a dose of South Indian history as you explore the stunning 5th, 6th and 7th-century temples of Badami, Aihole, and Pattadakal (all within 2 hours from Hubli). As a UNESCO World Heritage Site, you'll find around 10 temples in Pattadakal, showcasing different architectural styles. Our favourite is the Virupaksha temple (it's the largest and most embellished one here). Visit the cave temples at Badami, built by the Badami Chalukyas or head to Aihole (which is home to around 125 temples!) and make sure to visit Lad Khan Temple, one of the oldest temples dedicated to Lord Shiva.